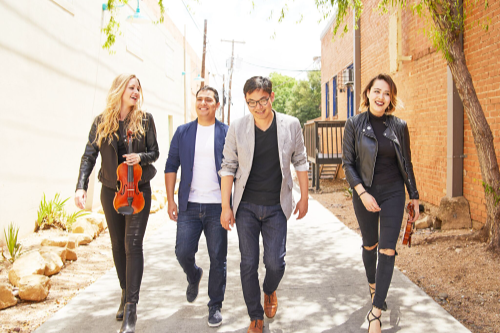 The Dallas String Quartet is an international music sensation comprised of violinists Ion Zanca, Melissa Priller and Eleanor Dunbar and jazz bassist Young Heo. The group provides a fusion of classical and contemporary music on both traditional and electric strings. With the 2016 release of their fourth album, DSQ, they continue to expand their passionate following on Pandora, Spotify and Sirius XM radio. The Wall Street Journal, A&E and ESPN have all featured the Dallas String Quartet and the group has played for Presidents Obama and Bush. The DSQ has also played alongside Josh Groban, Chicago and The Trans-Siberian Orchestra. Joining the DSQ at this special performance will be members of the string section of the local Florence Symphony Orchestra, under the baton of Dr. Terry Roberts.